Christoph Hess, a Fédération Equestre International (FEI) I Judge in both dressage and eventing, is highly respected around the world as a teacher of riding and the development of the horse according to classical principles. Here he collects some of his very best riding and training tips along with well-honed insight related to the topics that he finds most often challenge equestrians and their equine partners. Ride Better with Christoph Hess provides thoughtful, easy-to-apply advice when dealing with issues with the gaits, in particular the walk and canter; high-headedness or the horse that is too light in the poll; inconsistency of performance; leaning on the bit; falling out; lack of straightness; and much more. In addition, Hess breaks out particular skills and movements that often need specialized attention when in the dressage or jumping ring, and when going cross-country. Throughout Hess emphasizes that a rider must always strive to improve, for the simple reason that you can always do better for your horse. While competitive and training goals do, of course, bring a certain satisfaction, it is having an equine partner who is contented in his work and happy in your company that rewards most. 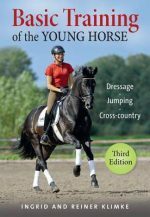 This lesson, and all Hess’s tips and solutions, are invaluable to equestrians of every level – everyone can walk away from this book a better rider. Christoph Hess is an FEI I Judge in both Dressage and Eventing. The German National Federation (GNF) awarded him the title of Professional Riding Instructor; a title that labels him as an international expert and educator of professionals. Hess currently holds the positions of Head of Instruction and Head of the Personal Members Department at the GNF, where he’s been employed since 1978. Hess is actively involved in the education of judges and instructors both within Germany and around the world. He conducts clinics, workshops, forums, and symposiums for judges, trainers, and riders throughout the international dressage and eventing communities. He is an examiner of judges and trainers at the highest levels of the sport of dressage, including seminars and testing sanctioned and sponsored by the FEI (Federation Equestrian International). Hess resides in Germany.